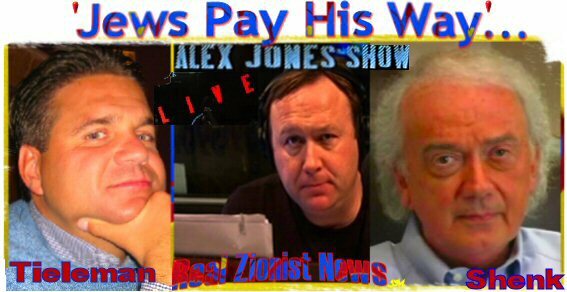 THE CONTROVERSY OF ALEX ‘BULLHORN’ JONES being an alleged Zionist shill has now expanded to his apparent Zionist-Jewish connections on his 1) Personal Staff 2) Website Advertisers 3) Link To Time Warner President, Edgar Bronfman Jr. Jones’ seeming allegiance to Zionism, which explains why he virtually never targets Zionist Jews or the racist, Zionist rogue state of Israel when engaging in his notorious rants and attacks, may well stem from a Protestant-Zionist belief system, and the widely circulated reports that his wife is a Jew - - which makes his two children Jewish under Talmudic law and eligible for the Israeli Law Of Return. In that Jones’ wife is of Jewish heritage, both she and the children would be automatic dual citizens…Alex would not qualify. Beginning With His Personal Staff, Jones’ Key Employees Are Jews: Rob Jacobson: Jones’ cameraman. Jacobson also does film and video editing work for Alex Jones. Alex Jones Also Has An Abundance Of Jewish Advertisers Who ‘Pay His Way:’ Henri-James Tieleman: President of EcoloBlue Life & Energy. Tieleman does live, on-air 10-minute commercials on Alex Jones’ radio show, and the regular recorded commercials are voiced by Alex Jones himself. Tieleman also has a large flash animation banner advertisement at the top right-hand corner of the main page of Alex Jones’ Prisonplanet Website. A JONES-BRONFMAN LINK? HOLLY BRONFMAN LEV IS Edgar Bronfman Jr’s sister. 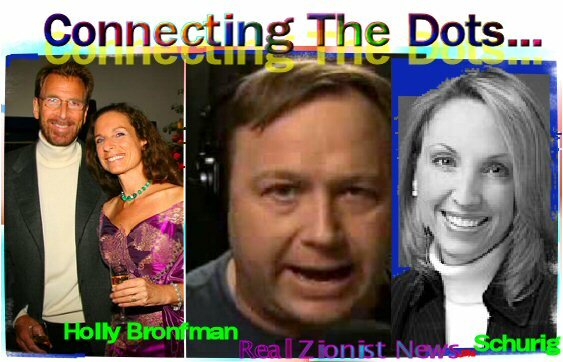 As founder of the Bet Lev Foundation and 100% owner of Lev Group Ltd, Holly Bronfman’s legal affairs are conducted by the high-powered lawyer, Elizabeth Schurig, who also happens to handle the legal affairs of Alex Jones.